1. Pharisees glory in their connection to godly men. We have Abraham for our father Matt.3:9 . 2. Pharisees glory in external righteousness. Jesus said, Unless your righteousness surpasses that of the scribes and Pharisees, you will not enter the kingdom of heaven. Matt.5:20 . 3.Pharisees do not mingle with sinful people The Pharisees said to Jesus disciples, Why is your Teacher eating with sinners? Matt.9:1 . 4.Pharisees are ascetics. Why do the Pharisees fast, but Your disciples do not fast? Matt.9:14 . 5.Pharisees are very critical of others in small matters. The Pharisees said to Jesus, 'Look, Your disciples do what is not lawful to do on a Sabbath. Matt.12:2 . 6.Pharisees live by rules. They questioned Jesus, asking, Is it lawful to heal on the Sabbath? - so that they might accuse Him. Matt.12:10 . 7.Pharisees are motivated by jealousy and hatred. The Pharisees went out and conspired against Jesus, as to how they might destroy Him. Matt.12:14 . 8.Pharisees are suspicious and assume the worst about other people. The Pharisees said, This man casts out demons only by Beelzebul the ruler of the demons. Matt.12:24 . 9.Pharisees are very careless in their speech. The Pharisees said, This man casts out demons only by Beelzebul the ruler of the demons. Matt.12:24 . 10.Pharisees neglect their family responsibilities in the name of religion. God said, `Honor your father and mother' ….But you say, `Whoever says to his father or mother, 'Whatever I have that would help you has been given to God,' he is not to honor his father or his mother'. Matt.15:1-9 . 11.Pharisees are easily offended. The disciples came and said to Jesus, 'Do You know that the Pharisees were offended when they heard this statement?' Jesus said, 'Leave them alone.' Matt.15:12-14 . 12.Pharisees are spiritually blind. They are blind guides of the blind. And if a blind man guides a blind man, both will fall into a pit. Matt.15:14 . 13.Pharisees are hypocrites. Beware of the leaven of the Pharisees which is hypocrisy. Luke 12:1 . 14.Pharisees seek to catch others in their words. Some Pharisees came to Jesus, testing Him and asking, Is it lawful for a man to divorce his wife for any reason at all? Matt.19:3 . 15.Pharisees are hard-hearted. This people honour Me with their lips, but their heart is far away from Me. Matt.15:8 . 16.Pharisees cannot appreciate loud praise in public. When the chief priests and the scribes saw the children shouting, Hosanna to the Son of David, they became indignant Matt.21:15 . 17.Pharisees have knowledge without obedience. The Pharisees have seated themselves in the chair of Moses; therefore all that they tell you, do and observe, but do not do according to their deeds; for they say things and do not do them. Matt.23:2,3 . 18.Pharisees do not practise what they preach. Pharisees say things and do not do them. Matt.23:3 . 19.Pharisees bind heavy burdens on others. They tie up heavy burdens and lay them on men's shoulders, but they themselves are unwilling to move them with so much as a finger. Matt.23:4 . 20.Pharisees seek honour from men. The Pharisees do all their deeds to be noticed by men. Matthew 23:5 . 21.Pharisees think that holiness is in the style of one's clothes. The Pharisees broaden their phylacteries (small cases containing Scripture texts worn on the forehead) and lengthen the tassels of their garments. Matt.23:5 . 22.Pharisees love positions and titles of honour. They love to sit at the head table at church dinners, basking in the most prominent positions, preening in the radiance of public flattery, receiving honorary degrees, and getting called 'Doctor' and 'Reverend'. Matt.23:6-8 - Paraphrase . 23.Pharisees corrupt others. Woe to you, Pharisees, because you shut off the kingdom of heaven from people; for you do not enter in yourselves, nor do you allow those who are entering to go in. Matt 23:13 . 24.Pharisees take advantage of poor people. Woe to you, Pharisees, because you devour widows' houses. Matt.23:14 . 25.Pharisees pray long, impressive prayers in public. Woe to you, Pharisees, because for a pretense you make long prayers; therefore you will receive greater condemnation. Matt.23:14 . 26.Pharisees do missionary work and make people twofold children of hell. Woe to you, Pharisees, because you travel around on sea and land to make one proselyte; and when he becomes one, you make him twice as much a son of hell as yourselves. Matt.23:15 . 27.Pharisees interpret Scripture without revelation from God. Woe to you, blind guides, who say, `Whoever swears by the temple, that is nothing; but whoever swears by the gold of the temple is obligated.' You fools and blind men! Whoever swears by the temple, swears both by the temple and by God Who dwells within it. Matt. 23: 16-22 . 28.Pharisees are sticklers for the letter of the law. You Pharisees tithe mint and dill and cummin, and have neglected the weightier provisions of the law. Matt.23:23 . 29.Pharisees have no justice, no mercy and no faithfulness. You Pharisees have neglected the weightier provisions of the law: justice and mercy and faithfulness; but these are the things you should have done….. Matt.23:23 . 30.Pharisees strain out mosquitoes and swallow camels. You Pharisees, hypocrites and blind guides - who strain out a gnat and swallow a camel! Matt.23:24 . 31.Pharisees concentrate on having a good testimony externally only. You Pharisees clean the outside of the cup and of the dish, but inside they are full of robbery and self-indulgence. Matt. 23:25, 26 . 32.Pharisees say they would never have done the evil that others did. You Pharisees build the tombs of the prophets and adorn the monuments of the righteous, and say, `If we had been living in the days of our fathers, we would not have been partners with them in shedding the blood of the prophets.' Matt.23:29, 30 . 33.Pharisees persecute God's prophets. I am sending you prophets…Some of them you will kill and crucify, and some of them you will persecute from city to city Matt.23:34, 35 . 34.Pharisees care much for the opinions of people. The baptism of John was from what source, from heaven or from men? And the Pharisees began reasoning among themselves, saying, If we say, `From men,' we fear the people; for they all regard John as a prophet. And answering Jesus, they said, We do not know.) Matt.21:25-27 . 35.Pharisees love money. The Pharisees were lovers of money. Luke 16:14 . 36.Pharisees imagine that they are better than others. Jesus spoke this parable to some people who viewed others with contempt: Two men went up into the temple to pray, one a Pharisee…who prayed to himself: `God, I thank You that I am not like other people. Luke 18:9-11 . 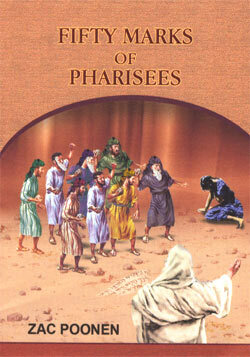 37.Pharisees trust in their own righteousness. He also told this parable to some people who trusted in themselves that they were righteous Luke 18:9 . 38.Pharisees look down on others. Jesus spoke this parable to some people who viewed others with contempt. Luke 18:9 . 39.Pharisees exalt themselves over others. This tax-collector went to his house justified rather than the Pharisee - for everyone who exalts himself will be humbled. Luke.18:14 . 40.Pharisees boast about their accomplishments. God, I thank You that I am not a swindler, or unjust, or an adulterer. I fast twice a week; I pay tithes of all that I get……. Luke 18:11, 12 . 41.Pharisees accuse others. The Pharisees brought a woman caught in adultery, and said to Him, 'Teacher, this woman has been caught in adultery….Moses commanded us to stone such women; what then do You say?' John 8:3-6 . 42.Pharisees imagine that God is their Father when actually Satan is their father. Jesus said to them, If God were your Father, you would love Me……You are of your father the devil, and you want to do the desires of your father. (John 8:42, 44) . 43.Pharisees are liars and murderers. Jesus said, You are of your father the devil, and you want to do the desires of your father. He was a murderer from the beginning, and does not stand in the truth because there is no truth in him. Whenever he speaks a lie, he speaks from his own nature, for he is a liar and the father of lies. (John8:44) . 44.Pharisees persecute those who don't listen to them. The Pharisees told him (the blind man who was healed), You were born entirely in sins, and are you teaching us? So they put him out (of the synagogue. John 9:34 . 45.Pharisees are jealous of those who can do miracles that they cannot do. The Pharisees said, 'What are we doing? For this man is performing many miracles'. From that day on they planned together to kill Him. John 11:47,53 . 46.Pharisees judge godly people for not doing something that they do. The Pharisees said, 'This man is not from God, because He does not keep the Sabbath. John 9:16 . 47.Pharisees test God by asking Him for signs. The Pharisees said to Jesus, 'Teacher, we want to see a sign from You'. Matt.12:38 . 48.Pharisees have no concern for lost sinners. The Pharisees said, 'This crowd which does not know the Law is accursed'. John 7:49 . 49.Pharisees value their traditions more than God's Word. Jesus said to the Pharisees, 'You are experts at setting aside the commandment of God in order to keep your tradition'. Mark 7:9 . 50.Pharisees justify themselves Jesus said to the Pharisees, 'You are those who justify yourselves in the sight of men, but God knows your hearts. Luke 16:15 .